Hope you'll stop by to take a look around. Proceeds from the shop help defray podcasting costs. Thank you! Been "Dabbling" in the Kitchen!! Here is a card I made with a new image I drew this weekend. It's from a photo of the apple-crab tree in our backyard. I haven't done many flowers yet; but this was fun to create! The card is made with textured cardstock, patterned paper from my stash (sorry, the name of the paper wasn't on the piece I had left!) and a ribbon that I coloured with my Copic # YR21 marker. A dragonfly charm was hung from thread also coloured with the Copic. The double bow was made using my Bow Easy tool. The image was cut and embossed using my Cuttlebug and Spellbinder's die, the edges inked with my Stampin' Up "Barely Banana" ink and then added to the card using foam dimensionals to pop it up. I left the sentiment off this one; I'll add whatever is appropriate once I decide to use it for a Thank You or maybe even a Condolences card. Do you want to use this image for your own cards? Then please visit my DigiDrawn site to purchase it for only $3! The neighbor's daughter was married last weekend; so of course I had to make her a special card. 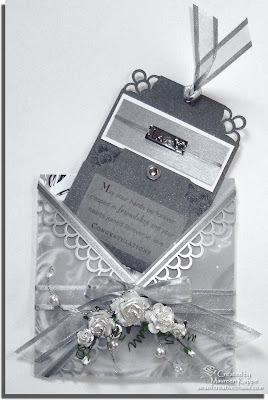 It was one of the main reasons I wanted to get my Wild Orchid Crafts roses! 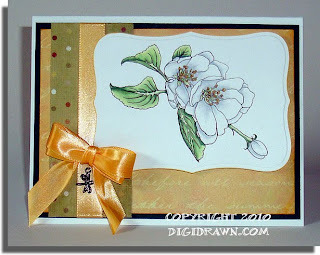 This criss-cross card was inspired by the vellum one done by Mina for the Just Magnolia Criss Cross card challenge. Since I only wanted the front to have the vellum (I found some perfect vellum with confetti in it! ), I cut out a long 12" high by 6" wide sheet of patterned paper from my DCW pad. I scored it in the middle and folded it so the fold was at the top. Then I cut out a vellum square slightly larger, cut it on the diagonal, scored the two straight edges and folded them back to wrap around the front half of the backing paper with my ScorTape. Before I added the second triangle, I decorated each side with my Martha Stewart double loop edge punch and another thin strip of metallic paper... good thing I have ScorTape in 1/8" width! It was perfect to use for this! After attaching both sides, I sealed the back flap to cover all the edges. I added a sheer ribbon and sealed it at the center. Then using my Bow Easy, I made a bow and adhered it on top. Then the Wild Orchid Crafts roses and a spray of pearls and gems for some more bling were attached on top. Finally, silver Stickles were added to the roses. Next came the work for the inside card. 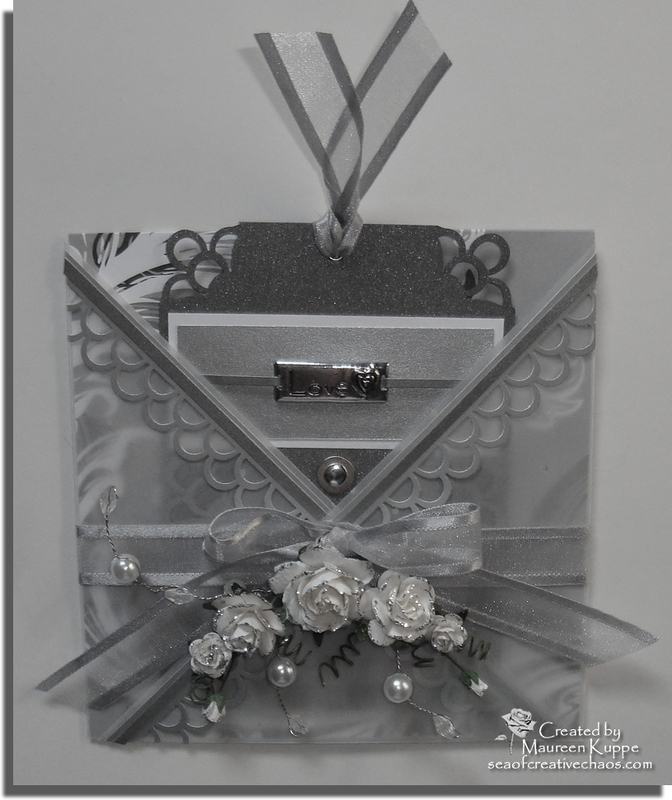 I started out with some heavy metallic cardstock that I scored, folded and punched with my Martha Stewart double loop corner punch. I added a magnetic clasp, topped off with a silver faux brad on front. Using my Crop-A-Dile, I punched a silver eyelet at the top and ran some more ribbon through it for the pull. 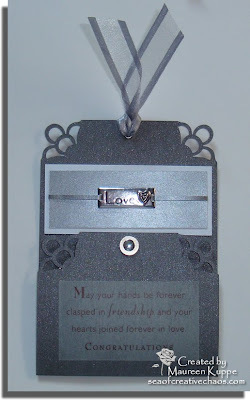 I decorated the card with more layers of silvery papers, and a charm that says "Love". On top of the fold I added a vellum sentiment, and inside used more ScorTape to attach a clear pouch to hold our monetary gift. A white card bordered with silver Stickles was finally added for our signatures.